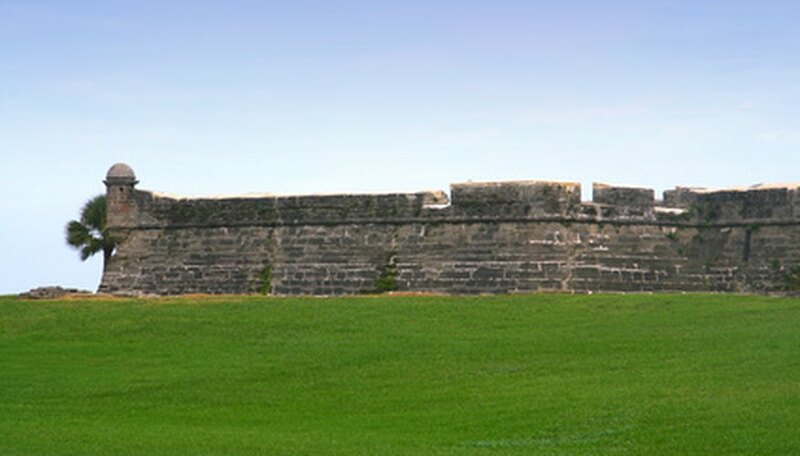 St. Augustine grass survives in a wide range of soil types and provides a lush green lawn in mild winter climates. Whether to plant grass plugs or do an instant cover with sod depends on a variety of factors, including product cost differences, amount of time and labor needed for the two types of plantings, and initial and long-term coverage. Once grass is planted, there are additional concerns with watering, fertilizing and weed control. Whether using sod or plugs, establishing a St. Augustine lawn is similar for both types of coverage. The Florida Institute of Food and Agricultural Sciences recommends planting when the grass will have the least amount of stress with the longest time to establish strong roots. For south Florida and other locations with very mild winters, this time is late fall, winter or early spring. In central Florida and parts of the country that experience winters with a few freezes, do not plant during cold winter or hot summer months. Buying sod is more expensive than buying plugs, since there is more grass in sod. Planting grass sod is also less costly in the amount of time and labor it takes to plant a lawn with plugs. With sod, squares are laid next to each other like bricks on bare, moist ground. With plugs, dig holes the same size of the plugs on a pattern of 6 to 24 inches, then take the plugs out of trays, place in the holes, and finally tamp into place. Water St. Augustine sod lawns daily for the first 2 weeks. Initially, a sod lawn needs short irrigations several times a day for the first 7 to 10 days. After that, a daily watering for 7 days of 1/4 to 1/2 inch should establish the roots. With plugs, an initial thorough watering is required, followed by keeping plugs moist until you see new shoot growth. With sod lawns, full coverage is completed once the sod is on the ground. To assure full coverage, sod should be planted and watered in within 48 hours of its arrival on site. Plugs can stay in trays 7 to 10 days if watered daily and given adequate sunlight. Plugs 2 to 4 inches high plugs planted on 1- to 2-foot spacings can cover bare ground in one growing season. Sod lawns generally have fewer weed problems than plug lawns. Sod covers all the growing area, and healthy St. Augustine does a good job of crowding out weeds. With plugs, until all the bare ground is covered, there is a greater chance of invasive broadleaf weeds or other grasses. Once the plug lawn is established, both it and the sod lawn are the same, contending with cool season weeds like clover and chickweed common to dormant St. Augustine.